The Kobelco SK55SRX delivers full-size benefits with short-radius capabilities. Mini-excavators are widely used at sites where space is limited. 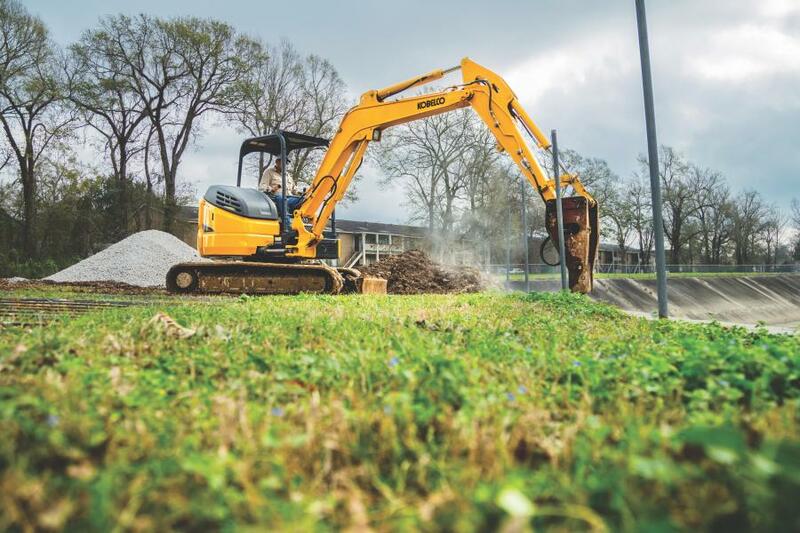 Users want big power in a small machine as well as stable operation, rugged construction and durability to reduce downtime. The Kobelco SK55SRX is a compact, yet tough performer that delivers full-size benefits with short-radius capabilities and exceptional features. Showcased on the SK55SRX, is the iNDr+E KOBELCO cooling system. iNDr+E incorporates the iNDr technology of large Kobelco excavators, into an eco-friendly cooling system that reduces noise to 75 dB. This innovative mini also utilizes ground-breaking energy conservation elements including an “S” mode, which enables the machine to reduce fuel consumption by 25 percent, according to the manufacturer. Equipped with a Tier IV Final engine, the Kobelco SK55SRX packs plenty of power for outstanding hydraulic performance. The integrated flow pump system delivers fast and smooth operation while raising the arm and boom — even during heavy loads. And, an automatic two-speed travel feature ensures smooth and efficient travel on the toughest job sites. The SK55SRX supplies ample muscle for heavy-duty digging and lifting and is excellent for loading, placing and dozing in various applications. A large boom and arm ensure a wide working range, while a short tail swing improves operating efficiency in confined space. The SK55SRX also features the new 4-way Kobelco blade; this optional blade delivers a left and right angle movement of 23 to 25 degrees for increased operator control during clearing, grading and back-filling.